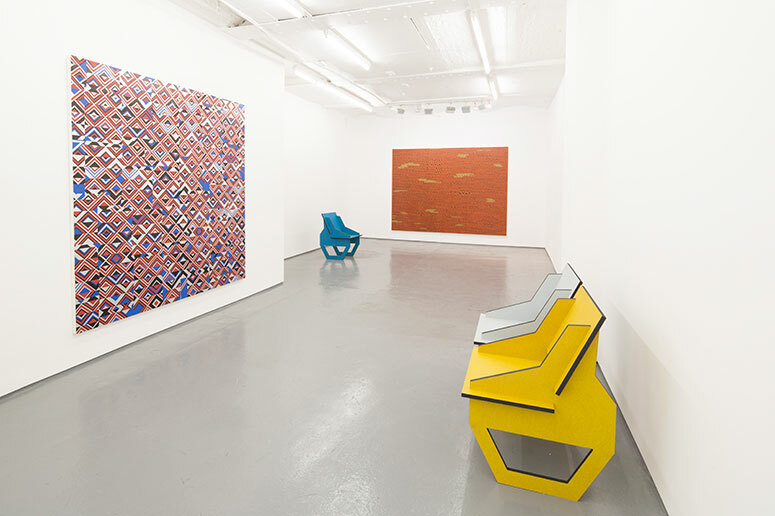 A restless influx of pattern and sensation permeates Dominic Beattie’s spectacular new work at FOLD Gallery. The four large works, and the stylish chairs, create an atmosphere that has a feeling of a 1970s hotel or gaming casino (Kubrick’s The Shining) – slightly casual in appearance, eruptive and coherent in equal measure. That experience is immersive; we are invited to sit and observe the interaction between the deco-repeated paper systems, constantly out of alignment, which draws us in to the painting’s edge and the dazzling picture spaces. In the second of the large-scale works the flat silver-sprayed ground is important throughout the composition, as it opens out the space across the diamond-shaped grid. The chairs in the space take on greater significance, as they perhaps do in later Braque works, or in a Patrick Caulfield painting such as Dining /Kitchen/ Living 1980. The emphasis on place seems to carry more autonomy, as the invented orchestration is more frontal in this all-over, highly-modulated four-panel structure. The light reds pop out of the structure the most, like a micro Joseph Albers. The Indian yellow catches the eye at peripheral points in the work. There is a very powerful presence/ absence, suggested not only by this painting, but by the whole installation. The final work in the show focuses on this approach, with a greater system of sequencing. This work looks the most physically demanding. The mindset here, concerning the colour limitation and the scale of the drawing, echoes the work of Michael Kidner, with his depth of research into wave theory. Kidner’s rational mathematical construction seems to me to be an influence in Beattie’s untitled works, in their sense of chaos. This work has the modulated sense of a Cezanne landscape, full of structural integrity and systematic procedure; it pushes that boundary.